Today it’s the 100th anniversary of a truly terrible train crash that changed the way the train industry used signalling systems. The crash that took place at Aisgill, near Mallerstang in Cumbria on September 2nd, 1913, is commemorated today outside the county, at the original signalling box which is now at a museum at Butterley in Derbyshire. It wasn’t the only terrible crash of that period on the fabled Carlisle to Settle line, sadly. It’s sometimes difficult for people to grasp that for most of history, it was really quite hard to get into Cumbria. We see that whalloping great stripe of motorway cutting up the Eden Valley, interlinking with various roads west, and can’t imagine that for a long time it was actually rather tricky to traverse. I remember that my Cumbrian granda (never grandad. Cumbrian grandfathers have no last consonant) always added the word, ‘up’ to Shap. You never went ‘to’ Shap, or ‘through’ Shap; always ‘up’ Shap. And whilst we know intellectually that Shap is very high – at 1,050ft it’s the highest point of the M6 – it doesn’t seem that bad because the incline is gradual and modern cars have no difficulty with it. A hundred years before this section of motorway tamed the valley, some very ambitious engineers started to built the Settle to Carlisle railway. This was the age of steam, and it proved difficult to flatten the route to the 1 in 100 gradient that steam trains could tackle confidently. 6,000 navvies worked on this 73-mile line throughout the early 1870s, digging out fourteen tunnels and building 22 viaducts. 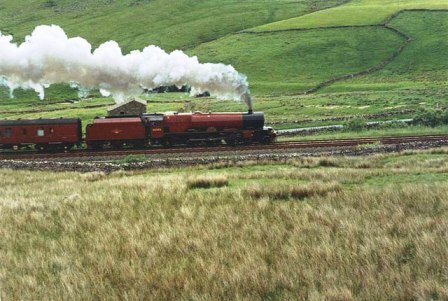 The railway line runs on slightly higher ground than the motorway, with the peak at Aisgill near the old Westmorland border, at 1169ft above sea level. It’s best known for two things; firstly, Hellgill Force, a 66ft waterfall; and secondly because there have been not one but three train accidents here. The simple fact was that despite all the clever engineering, the railway line was only just flat enough for steam trains to manage. Sometimes, trains needed to ‘double-head’, meaning that two engines were coupled together to haul a single train; or a ‘pilot’ engine was brought in to add extra pulling power at the front. The exception was the Scotch Express, a relatively powerful train travelling between London and Glasgow. On a very dark Christmas Eve morning in 1910, a signalman got word that the Scotch Express was on its way. He cleared the stop signal so that it could pass through. Unfortunately, he’d forgotten that there were two less powerful light engines waiting at that very same signal. The light engines set off up the steep slog to Aisgill, but the Scotch Express soon caught up with them. The powerful train hit the light engines with such speed that it rode over the top of the rear carriages and wholly derailed the smaller of the two. The gas lighting in the carriages was ignited by hot coals from the engine, generating an intense fire from which the trapped passengers could not escape.Twelve people died, and seventeen were injured. The investigation showed that the signalman was clearly at fault, but the drivers of the light engines also failed to follow some warning procedures. Just three years later, in the small hours of September 2nd, 1913, two trains prepared to leave Carlisle station. Both drivers queried the quality of the coal; it contained a lot of slack and small pieces, which would reduce the amount of power the engine would be able to deliver. Nicholson, the driver of the 01:35am train, was particularly unhappy as his train had ten carriages and weighed 13 tonnes more than the maximum rated for his engine on this steep route. He asked for a pilot train to haul him up the 1 in 100, nine-mile stretch from Crosby Garrett to Aisgill, but none were available. The train could normally manage 40mph, but by Mallerstang, it was only achieving half that; half a mile before the summit at Aisgill, the train finally ground to a halt. Meanwhile, the Edinburgh Express had left Carlisle eleven minutes after Nicholson. Whilst it was a much lighter train, the driver, Caudle, was also having difficulties. Near Mallerstang, he left his cab to tackle a problem with his axle box, and missed one ‘danger’ signal. On returning to his cab, Caudle dashed over to look at an injector, missing other signals. Nicholson, in charge of the stationary train, saw Caudle’s express approaching and tried to coax the engine back into life but without success. His guard ran down the line blowing his whistle and waving a red flag, but by now the weather was terrible and there was little chance that Caudle would spot him. The Edinburgh Express hit the back of Nicholson’s train, demolishing the back three carriages and sending debris forward into the rest of the train. The cab caught fire, creating a blaze so ferocious that the bodies of seven victims were consumed without trace. Seven more bodies were recovered, and a further two people died shortly afterwards. Sadly, this wasn’t Aisgill’s last train disaster. 82 years later a train travelling in heavy weather on 31st January, 1995 was derailed by a land slip, ending up straddling both lines. The driver was injured, so the conductor was in charge of the site. He turned their own lights to red for danger but forgot to put the required warnings a mile down the line. Just six minutes later, another train saw the warning light on the derailed train but there wasn’t enough time to stop before impact. Thirty people were injured, and one, the conductor who struggled with the warning system, was killed. Men were held culpable for all of these accidents. But there’s no doubt that the Cumbrian weather and landscape, which played a part in all of these accidents, can be very dangerous indeed. Further reading: Eden Tapestry (1995) by Charlie Emett. This entry was posted in History of Cumbria, History: 20th century and tagged ais gill, aisgill, carlisle to settle, cumbria steam train, cumbrian history, settle to carlisle. Bookmark the permalink.